When I finally got my paperback copy of my book, that I had spent over a year writing and perfecting, I knew the exact place I was going to place it on my bookshelf. The only proper place for something so important to me was right next to the book series that was the reason I became a writer in the first place. So I placed my own book, Is There More? right beside the Harry Potter series, where I can see it everyday. It has been a long year for me not only perfecting my stories but also learning how to self-publish this collection. Throughout that year there was many times that I doubted what I was doing and wondered if I could actually do it. And every time I had that moment I would look over at my bookshelf and remember why I wanted to do this. I know the Harry Potter series and J.K.Rowling herself have done a lot for many people. The series opened up the magical world that is reading to so many who had closed the door on it perviously. The series gave people somewhere to escape to and provided characters we all could relate to. The series brought together people of all ages through a mutual love of this world and this story. I always loved to read. Reading has always been my escape when the world around me gets too difficult or confusing. I loved to read before I ever picked up the first Harry Potter book. But what reading that specific series did for me was show me the power that words truly have. It showed me that words can change the way people perceive the world and interact with it. And I quickly realized that I wanted to do that with my life. I found the first Harry Potter book at a book fair, one of my favorite things at school. I picked it up because it was a fantasy story about wizards and sounded interesting. I had no idea what I was holding in my hands. I had no idea it would be a series that would capture the heart of so many around the world. I did not know that this one book was my own gateway to where I wanted to take my life and would give me a pathway for my own career. I devoured that book along with the second and third. I remember when the fourth one came out I was not able to attend a midnight release. My aunt actually bought me the fourth book (which I greatly appreciated) but I had to wait a few days to get it. I remember sitting on my front porch disappointed that others were able to read the book while I had to wait. I did not want to wait, I had waited long enough to enter back into that world. But I read it the whole eight hour drive to my another aunt’s house, enthralled as I knew I would be. 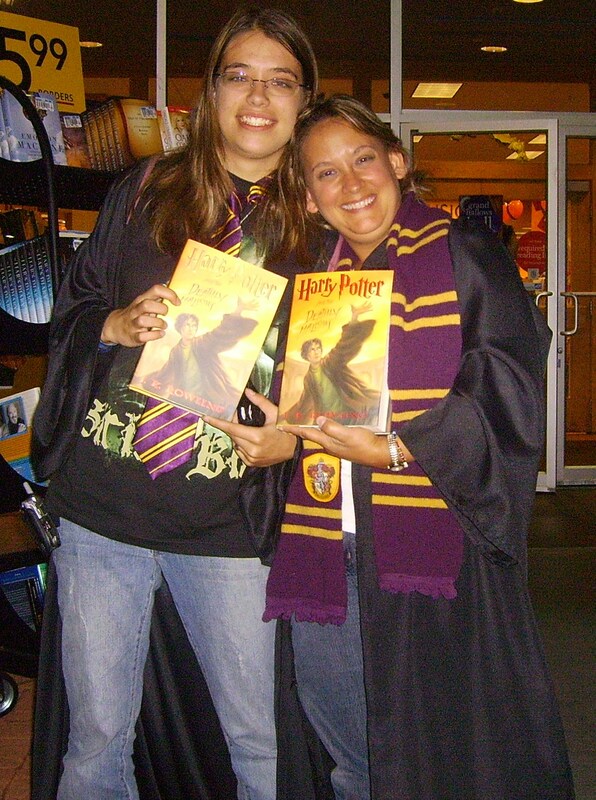 Me and my mom with our copies of Deathly Hallows! I did attend release parties for the last three books and even dressed up for the seventh book’s release. I loved falling into that world even when I was not in the pages. The series gave me a way to belong and I desperately needed that at that time. I felt a part of something, something big and I loved that. I needed to feel part of something because in my early school years I felt like I did not belong anywhere. Harry fighting through all that he did and still winning gave me hope. I was not a popular kid in my early school days and I held onto Harry and his world as a way to not feel completely left out. While the series gave me a way to belong and a way to find confidence in myself, it also helped me realize what I could do with my own pen. I began writing with fanfiction. I wrote stories about what I thought would happen to Harry and Ron and Hermione in between the release of the books. I needed a way to fill that gap and that was how I did it. They were not the best stories, full of grammar issues, plot holes and inconsistencies, but they were my way of releasing my imagination onto the page. People read them and didn’t hate them and I began to wonder if this could be my talent. For a long time I wondered if I actually had a talent at all. I was not good at a lot of things. I tried everything from baton, dancing, clarinet to volleyball and softball and I honestly sucked at them all. I was good at being bad at things and it became kind of a running joke for me. I laughed about it but it did get old quick. I watched everyone around me do things well and I wondered when I would find what I was good at and enjoyed. I found Harry Potter and picked up my pen. I saw what J.K. Rowling did with her imagination and her words. I realized that words have power and if used correctly they can do wondrous things. Words can change people’s worlds and how they see themselves. I began writing fanfiction and after floundering for a long time I found what I wanted to do. I denied what I wanted for a while though, even went to collage for Zoology, thinking that writing could only be a hobby. But I quickly figured out that I could not put writing on the back-burner. Whenever Zoology got too hard and I couldn’t take the science courses anymore I read or I wrote. I knew that I wanted to do what J.K. Rowling did, open up a new world to someone, anyone, anywhere. I wanted to use my own imagination and show the world something new and provide an escape as well. I can safely say that J.K. Rowling is the only celebrity that I ever looked up to or used as a role model. There were celebrities that I liked but I did idolize them. But J.K. Rowling was different . She created this world for all of us and she has kept it alive all these years. Her prose is fantastic. Her characters are deep and full of life. The story is one we all can find a way to relate to and the twists and turns are exciting and thrilling. But what I loved most about J.K. Rowling is that she has not walked away from this world. She did not hang up her cloak when she wrote that last word on that last page. She knows how important Harry Potter is to so many and she continues to live in the world right beside the rest of us. She created a family tree for all of the characters. She continues to give us extra information about the characters and wands and so much else through Pottermore. This year was James Potter (Harry’s son) first day of Hogwarts and she wished him well and even told us what house he was sorted into. It is exciting and heart-warming to see someone so in love with their own work. At the premier of the last part of the last movie she said, “ Whether you come back by page or by the big screen, Hogwarts will always be there to welcome you home.” I love that quote. I love that she understands how much Hogwarts has become home to so many and hopefully will continue to be for years to come. 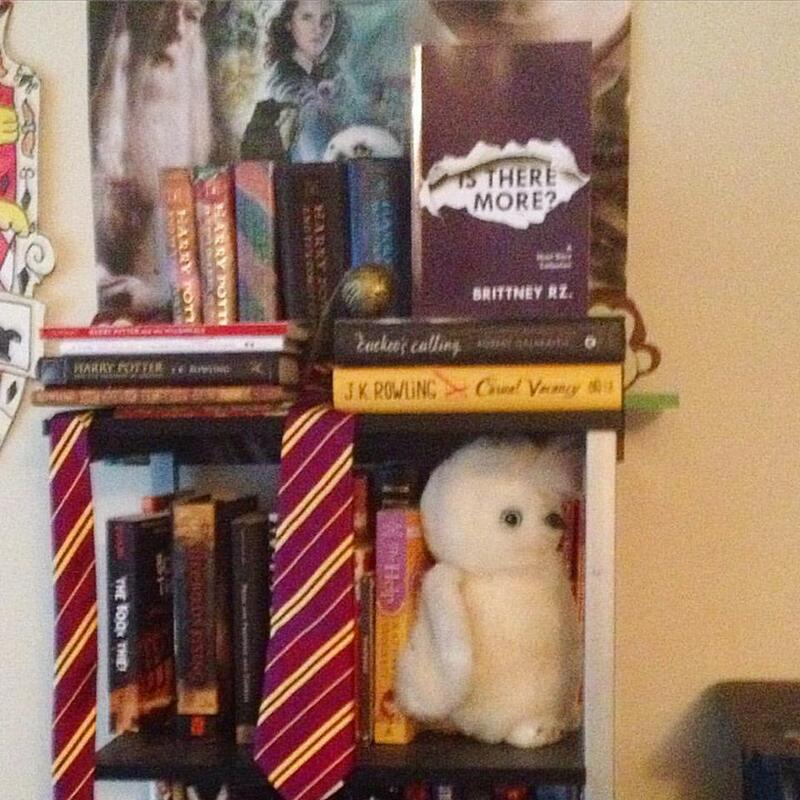 Whenever I become discouraged or frustrated while writing I pull out a Harry Potter book or just look over at my bookshelf and remember why I am doing what I am doing. J.K. Rowling and Harry Potter showed me what I want to do with my own writing. I not only want to sweep people away to somewhere fun and exciting full of relatable characters but I want to show them a new way to see the world and themselves. I do not know what I would be doing now if I had not found the Harry Potter series. And I don’t actually want to know. I love the path I am on. It is not an easy one and figuring this all out can be difficult but I am determined to keep going forward. J.K. Rowling took a chance with writing the Harry Potter series and I am grateful she did. If I can make a sliver of the impact that J.K. Rowling and Harry Potter has done for me for anyone else I will consider myself a success. Posted on October 10, 2015, in Writer's Perspective and tagged Harry Potter, indie author, inspriation, J.K. Rowling, self published, writing. Bookmark the permalink. 2 Comments.